Is LED ZEPPELIN about to reunite for the 2017 "Desert Trip" shows? A cryptic post on Robert Plant's web site has led to uncorroborated fan speculation that the legendary band may return for a festival performance later this year. According to The Pulse Of Radio, several industry sources have supposedly told the FeelNumb.com site that Plant — presumably the lone holdout over the past decade — has agreed to team up for the still-unannounced festival and front the band. It was widely reported that ZEP turned down a whopping $14 million to play last year's two weekend event, which featured THE ROLLING STONES, Paul McCartney, THE WHO, Bob Dylan, Roger Waters and Neil Young. Fanning the flames is the fact that Plant's official web site features a blackened page with only the white words: "Any time now..."
Considering that Plant has been working on a new album with the SENSATIONAL SPACE SHIFTERS since January 2016, a more likely explanation for the message on his web site is simply that he is preparing his online home for a redesign to come with the announcement of his next solo project. LED ZEPPELIN's December 10, 2007 reunion at London's O2 Arena during the Ahmet Ertegun tribute concert was chronicled on the band's 2012 "Celebration Day" CD and DVD. 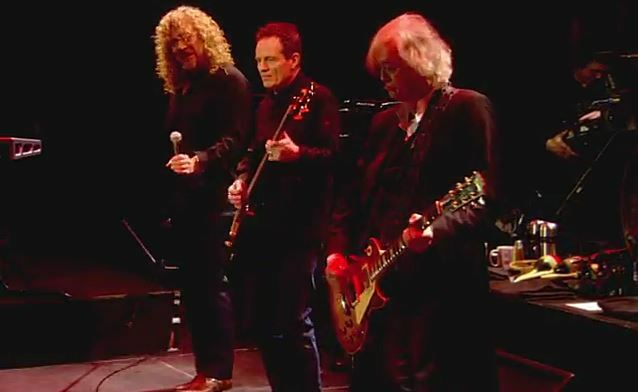 The set, which featured Jason Bonham subbing for his late father John Bonham on drums, marked Plant, Jimmy Page and John Paul Jones's first full-scale concert together since John Bonham's 1980 death. Plant shed light on how the 2007 reunion only spurred on more desire for ZEPPELIN to become an ongoing matter. "In a way, obviously, it's pressure again, but it's a different kind of pressure," he said. "The last lot of pressure was, like, having the physicality and the mental capacity to be what we were many, many years ago and actually have conviction and be on it. And people can take it or leave it — but it was great, it was really good. And then you drift off and you get surrounded by this stifling industry that is: 'why don't you….' 'have you thought about…. ba, ba, ba.' But when we spend time on our own, bit by bit, we become friends again." Shortly after ZEPPELIN's 2007 reunion gig, Jason Bonham told The Pulse Of Radio that a future run with the band was entirely up to Plant, Page and Paul Jones, and that if they decided to go ahead with it, he was on board immediately. "I didn't want anything else more than when I rehearsed with them," he said. "If it hadn't gone any further, just that day, and we went out for dinner, and just the backwards and forwards banter and the laughing and joking — that was enough. But if they decide to do it again, of course I would love to. But that's up to them. Only time will tell. If you'd had asked me a year ago, 'Are they gonna do a date next year?' I'd have gone, 'No way.' So I was proved wrong once before."